Sugar. Talk of it is everywhere. It's one of the leading causes of obesity and diabetes in our country. It is an ingredient so common to us that it is difficult to imagine a world without it. The first reference to sugar in classical literature is attributed to Nearchos of Crete, one of Alexander the Great's commanders, who in 327 BC reported "a reed in India brings forth honey without the help of bees" while sailing from the mouth of the Indus River to the Euphrates in modern Punjab. The 1st century Greek naturalist Dioscorides accurately described it as "a kind of solidified honey of a similar consistency to salt". The idea that sugar was a kind of salt persisted well into the Middle Ages when it was occasionally referred to as "Indian salt." Sugar remained exotic in Europe until the 12th century, when Arabs started cultivating it in Sicily and Spain and it began to rival honey as the sweetener in Europe. The discovery of the New World in the 15th century led to the extension of sugar cane cultivation - first in the Caribbean, Brazil, and Mexico, then in the islands off the Indian Ocean and the Philippines. 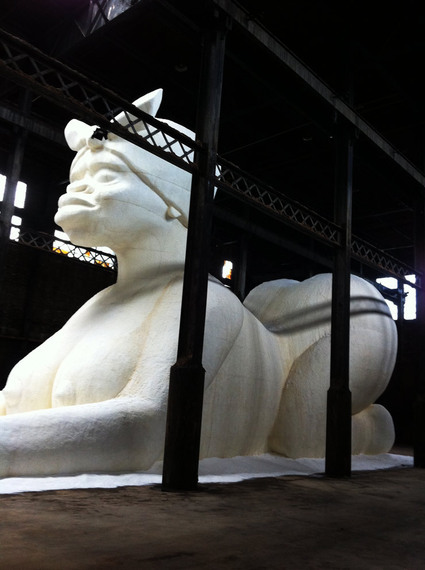 The growing European demand for sugar - increased by the fashion for sweetened tea, coffee and chocolate, and the desire for sugar sculptures among the aristocracy - was one of the major reasons for the slave trade. It is striking to me that 18th century French aristocrats would decorate their dessert tables with dainty, sensual, and sometimes sentimental sculptures made of this luxurious ingredient. Matte porcelain sculptures that resembled the sugar's surface texture were also popular. 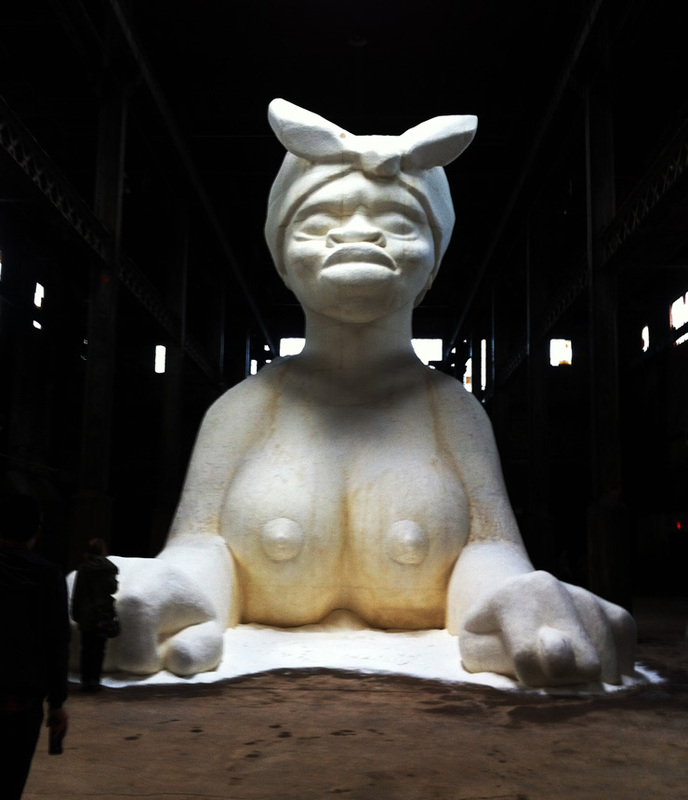 These sculptures, called subtleties, are what first came to mind when viewing Kara Walker's "Subtlety, or the Marvelous Sugar Baby" installation at the former Domino Sugar Factory in Williamsburg, Brooklyn. Though, at 35 feet tall, Walker's baby is anything but dainty. Or subtle. "A Subtlety, or The Marvelous Sugar Baby Subtlety an Homage to the unpaid and overworked Artisans who have refined our Sweet tastes from the cane fields to the Kitchens of the New World on the Occasion of the demolition of the Domino Sugar Refining Plant" runs through July 6 and is made possible by Creative Time. This Peach Cobbler recipe is in homage to all those men and woman who worked on a sugar plantation and is inspired by Kara Walker's installation. As far as the consumption of sugar... everything in moderation. 1. Preheat oven to 375º F. Lightly butter an 8x10-inch baking dish.